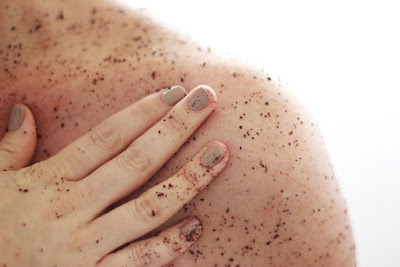 Obtain either your own used caffeinated coffee grounds, freshly ground caffeinated coffee beans (this makes a stronger treatment) or instant caffeinated coffee (if you don't make your own caffeinated coffee at home). Mix 12 drops of rosemary essential oil into three tablespoons of virgin olive oil. Mix 1 part sugar (brown or white, your choice) with 3 parts coffee. Then blend the rosemary infused olive oil with the coffee and sugar mixture to make a paste. Store in the refrigerator until use. Twice a week, briskly rub your coffee cellulite treatment scrub onto troubled areas, wait for three minutes, then rinse off.